Family friendly pub in the heart of Victoria Park. 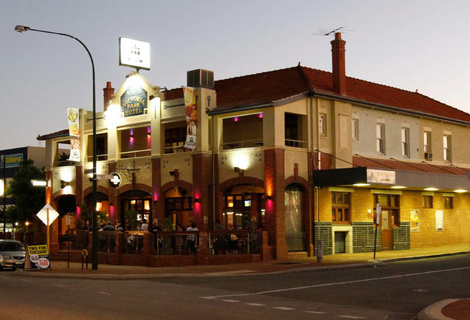 Victoria Park Hotel was reviewed on Wednesday 14th December 2011 18:30 by Richard. It has been a while since I've been to a pub on "Steak Night", too long in fact. So we decided to go down to the Victoria Park Hotel (VPH) for a $15 steak special. The pub was quite empty on arrival (as expected for most suburban pubs in Perth at 6:30pm) but it quickly filled up and within an hour people were being issued wait times for tables. The service was great we were greeted with a big smile and taken to our table straight away in the restaurant section of the pub. I didn't pay the menu much attention as I was there for one thing and one thing only...BEEF! In the quick glance I did have at the menu, nothing in particular jumped out at me, all the staple pub meals were in there, parmies, steak sandwiches, a small selection of pizzas and salads with the occasional pasta thrown into the mix. The drinks list was much the same although we were informed by our waitress that they were in the process of changing "quite a few" of their beers, phasing out old favourites such as Swan Draft and for more boutique/premium varieties. The great thing about the VPH is it is one of the few remaining pubs in Perth that still offers table service (for both food and drinks). Maybe it's just me but I'm not the biggest fan of lining up to order food and then spending the next 20 - 40 minutes staring at a buzzer waiting for the damn thing to go off. We ordered our food and drinks and were told that it was $2 extra for a sauce other than the stock standard gravy. The amazing sounding $15 dollar steak had some fine print, but at least we were told about the extra charge. The drinks came about 10 minutes later and the steak not too far behind. As you'd expect for a $15 steak (or $17 depending on your sauce requirements) it was rump. Advertised as 250grams, however either the chef needs an eye test or he was feeling generous as they were defiantly bigger than 250grams, not complaining or anything! The steak came with a small salad and a good handful or two of chips. It was cooked as requested and the pepper sauce was full flavour. We then ventured into the "bar section" of the pub, which was quite busy for a Wednesday night. The crowd was a pretty diverse mixture of people including; families with young kids, people having a casual after-work drink and a uni students. The bar has 18 beers on tap, a fairly standard wine list and more plasma screens than you can throw a stick at. Obviously why they market themselves as "the area's premier sporting and entertainment venue". There is also a small outside area where you can have a drink or a meal. Overall I was impressed with the speed and friendliness of the service and it was great value for a pub meal with reasonably priced drinks. Their other special night is a "Tight Tuesday" style buy one meal get one free. It's location on Albany Highway is a stones throw away from other restaurants and only a 15 minute bus ride into the city.